The company departed from the Sacred Grove, heading north along the Ribbon toward Ternyn and the aid promised by Llewer. On the road, spreading slowly out like pearls on a necklace, Caerdwyn pulling forward, Evayn dragging at the rear, attended by one of the men, alternately. The idea of cutting directly through the easy byways of the Elderwood, to reach the Afon Tonead and make their way most speedily to the Ternyn capitol of Aberavon was considered and rejected, preferring the open plain and the road to even a bountiful forest. That afternoon, a handcart was discovered, unattended in a green field east of the road. It was full of Arddbyn’s famously delicious purple pumpkins. As in the episode of the ghosts outside the coal shack near Teinwood, there was an area in front of the cart that was completely lacking in scent or other evidence of whoever had taken the cart there, or what had happened to them. The green fields of Arddbyn offered mute innocence. Caerdwyn peered about with the Eye and noticed that the Elderwood behind them had strange flashes in it, as of sentience arising and falling away. Or possibly glinting dewdrops on turning leaves. Surely that must be so. They continued on their way, passing one night in the open gathered about a bonfire made from felled trees from the Elderwood. It was the warmest, best night’s sleep they’d had in some time. The next day, their slow progress continued, and as evening fell, Llewer told them they were close to the border of Ternyn, and the fort on a hill at the crossing called Caer Bwyn. If they pressed on, he suspected they could reach the Caer’s safety and food by early night. 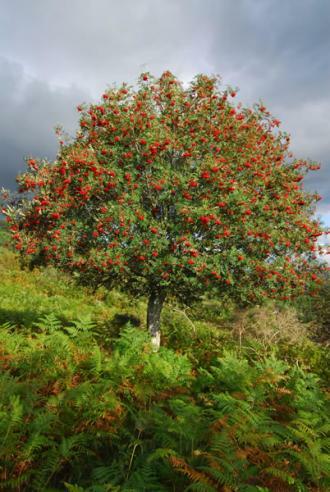 Rowan trees, thrown far out from the approaching forest of Rowanoak’s edge, burning bright with color, marched with them in the fading day, as the blue sky above seemed to shrink in upon them. The night also brought a ground-hugging fog creeping up from the plains, or out from the forests, racing them north toward Ternyn, bringing a wet chill that nothing the black and empty sky could match. As a strange beacon of hope, bright Loynnir watched over them, passing slowly across the sky. Eventually, what they had thought were bright horizon stars ahead resolved themselves to be lanterns, and after that, lanterns carried by a company of horesemen making their way along the road. The party waited in stillness, shielded by the armored riders’ lanterns and Loynnir at their backs. Upon their meeting, there were tension and drawn swords, and their leader unhorsed and unsaddled by his mount. It became clear that the leader of the group was Huw, Llewer’s Uncle, and that his cousin Dafydd was also among them. They had heard from a bard that Llewer was returning to Ternyn, and had been dispatched to see him home, and his news delivered safely and straight-away to Aberavon. The party joined them on horseback, beating the fog to the hill of Caer Bwyn, which seemed too high for the thick fog to surmount. They were allowed to bathe and eat and settle before Llewer invited at least Caerdwyn and Bayeo to come with him to have a conversation with his Uncle Huw, the fort Commander Heilyn, and someone the uncle had mentioned with some reserve, named Master Ianto. Both Caerdwyn and Greg were eager for this new chapter. We were eager to see the new lands and to see fabled Ternyn, who if they were anything resembling the likable, charming Llewer would be a welcome change from the xenophobic, superstitious, bitter people of Teuthal. And I think Caerdwyn was looking for a new place he could call home. Distraught over his last few adventures, he was seriously weighing in his heart whether it was even worth it to continue on his quest, or simply seek to hang up the cloak and sword, and forge a new life here. He felt like a pawn (or maybe a knight) in someone else’s game, and he particularly like his position on the board – nor the player he was sided with. Attacking the pumpkins in the cart was meant to symbolize Caerdwyn’s first act of defiance against the gods. He perceived the cart and the fruit to be a bounty provided for Evayn and her unborn, and his assault against it (while comical to his companions), was meant to be a rejection against them and their gifts. The pumpkin was a surrogate to what he would’ve liked to have done to the guardian in the grove. Still, he was trying to cool his anger and start anew in the lands of Ternyn!